Before May, Altona to Parliament off-peak on weekdays was a 30 minute trip with no changes. 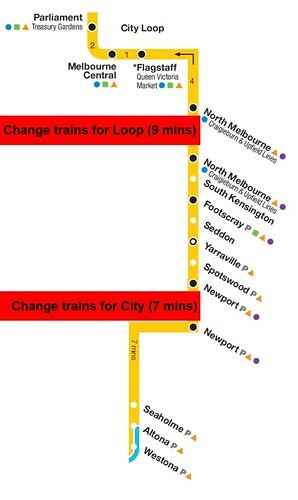 Now it’s two changes (Newport, 7 minutes, and North Melbourne, as much as 9 minutes if following the Metlink Journey Planner), for a total trip time of some 46 minutes. Connection times at Newport are worse than those formerly endured by Williamstown passengers: 7 minutes now vs 6 then towards the City; 6 minutes now vs 2 then coming out of the City. Combine that with regular reliability problems on the line due to track and signal faults, and it’s no wonder Altona residents are unhappy. They’re heading up to Parliament today to protest for a better deal, catching the 11:32 train from Altona, and meeting on the steps at Parliament at 12:30pm. See the details on their Facebook group, or read more about it in today’s Age.